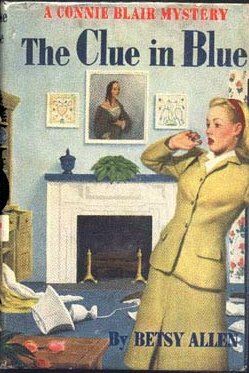 I recently reread The Clue in Blue and the Riddle in Red. Both of these Connie Blair Mysteries take place in Philadelphia. As a flight attendant based in Philadelphia, I spend a few days there every month. I have seen a lot of the standard tourist attractions: The Liberty Bell, Independence Hall, and the United States Mint. However, Philadelphia as seen through the eyes of Connie Blair is a different place. Connie doesn't mention the Liberty Bell or Betsy Ross' house. She is a career girl and spends her time working and solving mysteries. The Philadelphia in these books is the city as seen by a resident, not a tourist. Connie is actually from a small town called Meadowbrook (about a 2-hour train ride away from Philadelphia.) In The Clue in Blue, she goes to the city to be in a fashion show for her Aunt Bet. Connie enjoys herself so much, that in the second book, The Riddle in Red, she returns to Philadelphia to live with Aunt Bet. She goes to work for an advertising agency. Aunt Bet lives in Center City, a prestigious address in 1948 and today. She is within walking distance to her job at Campions department store. In the 1950's downtown Philadelphia had its share of regal department stores. Connie mentions one store called Wanamakers. Wanamakers was a prime example of the golden age of the department store. The Wanamaker building on Market Street in Philadelphia is from a time when department stores looked like palaces. It has a 9 story grand courtyard and the world's largest pipe organ. At Christmas time, the Light and Music Show is a wonderful Philadelphia tradition. The store is now operated by Lord and Taylor. Connie and her Aunt Bet do not need their own automobile to get around Philadelphia. They take the train, trolley or taxis. Philadelphia is like New York City or Boston where it is possible to live without a car. When Connie takes the train to and from Meadowbrook, she embarks at the 30th St. Station. The train station was built in 1933 and is the second busiest in the country. It appears in the movie Witness. The murder at the beginning of the movie takes place in a rest room at the 30th St. station. Aunt Bet's stylish Center City apartment (I wish I could afford an apartment in Center City) is decorated with Pennsylvania Dutch items. They are within walking distance of Rittenhouse Square. Rittenhouse Square is a park that is named after an 18th century astronomer and mathematician, David Rittenhouse. The park originally served as a pasture for stray cows, pigs and chickens. Today and when Connie would have visited the park, it is a lovely place for a picnic. The park contains a small wading pool, fountains and statuary. 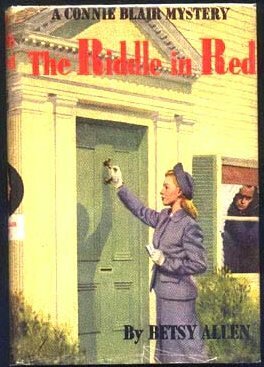 In the Riddle in Red, Connie solves a mystery that takes her out to the Main Line. The Main Line is Philadelphia's most luxurious suburb. (Miss Marville in the Riddle in Red lives in Haverford on the Main Line) It is called the Main Line because it is along the main line of the Pennsylvania railroad. Today it is still one of the busiest segments of commuter railroad in the country. Solving mysteries always builds your appetite and Connie has dinner at the General Wayne Inn in Merion, PA. Legend has it that Edgar Allen Poe wrote portions of "The Raven" while dining in this tavern. When in the city, Miss Marville stays at the Warwick Hotel. The Warwick is located on Locust Street at 17th in Center City. Rooms will cost you $200 dollars a night. The lobby is dazzling and the Palm Court Bar has won awards as the best city bar in Philadelphia. Connie mentions attending a concert at the dingy Academy of Music. The Philadelphia Orchestra has spent 100 seasons performing at this historic site. It is the oldest opera house in continuous use in the United States. The 2000-2001 season is said to be the last. A new orchestra hall with better acoustics has been commissioned. What impresses me most about these books is not the differences in Philadelphia since 1948, but how much things have remained the same. Also I discovered many interesting parts of the city that I had not explored before. The 30th St Train Station and Rittenhouse Square to name a couple. As a "professional traveler", I am always interested in the places described in series books. Did the author give an accurate description? IN the Connie Blair series set in Philadelphia, I must say that the author did an excellent job of describing Philadelphia in 1948!